The Callaway Apex Pro Forged iron is designed with the advanced player in mind and defies conventional wisdom by delivering extreme X Hot distance and performance in a forged iron. This forged iron features an ultra-hot face coupled with tungsten sole inserts to create a low center of gravity (CG) which increases forgiveness and launch angle generating a level of playability you would not expect from a forged iron. This iron has a forged carbon steel construction which delivers the soft, responsive feel better players demand and the high performance wide groove face design allows for more spin and increased carry from any type of turf condition. Ultra Hot Face and Tungsten Sole Inserts create a low center of gravity (CG) which increases forgiveness and launch angle generating a level of playability you would not expect from a forged iron. High performance wide groove face design allows for more spin and increased carry from any type of turf condition. What year were these clubs made? These were made in 2013-14. 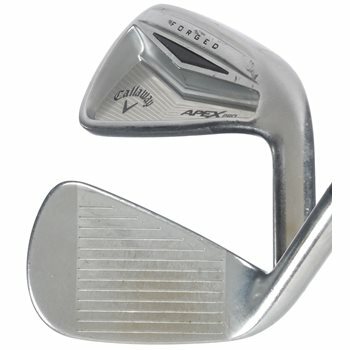 Do you have photos of the actual condition of these irons? Unfortunately, we are unable to provide pictures of a specific set due to the size of our inventory and multiple shipping locations.